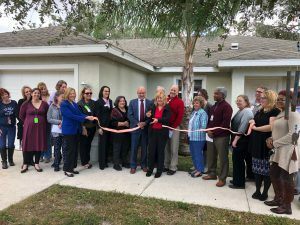 SalusCare Place is a Recovery Residence located in central Ft. Myers, Florida where individuals with substance abuse issues and addiction can find a “recovery family.” The first unit at SalusCare Place, The Bryce Burke House, officially opened on December 12, 2017 with a ribbon cutting ceremony attended by more than 60 community members. Individuals must desire a sober and supportive living environment. Individuals must agree to comply with all rules and regulations of the recovery residence community. Potential admissions will be screened to ensure appropriateness for the community. Admissions will be completed by program staff. Individuals admitted to the community will work with a Recovery Coach to assure they remain on their chosen path to sustainable recovery. *The recovery residences at SalusCare Place follow the standards of the Florida Association of Recovery Residences (FARR) and the National Association of Recovery Residences (NARR) whose mission is to support persons in recovery from addiction by improving their access to quality recovery residences through standards, support services, placement, education, research and advocacy.